Since then, iReport has become a significant newsgathering tool. When affiliate stations in Hawaii lost power after an earthquake in 2006, CNN aired the only images it could get, which came in from users. In 2007, Wheatley said, iReport proved itself to the newsroom during the Virginia Tech shootings. It showed we could get exclusive footage of breaking news, and we could distinguish our coverage by asking people who were directly affected to immediately share stories. A feature about the victims based almost entirely on user content got 18 million page views. Earlier this year, CNN gave iReport its own URL–ireport.com–and set up a system that lets users determine what stories are “newsiest now.” That section “challenges our ideas of what is news,” Wheatley says. iReport now has a dedicated staff of seven producers who spend much of their time screening and vetting material to incorporate into news coverage. They’ve also trained much of the news organization to do that, too. According to the iReport site, more than 1200 user contributions aired on CNN last month in one form or another. CNN International even has a half hour TV program based on iReport contributions. 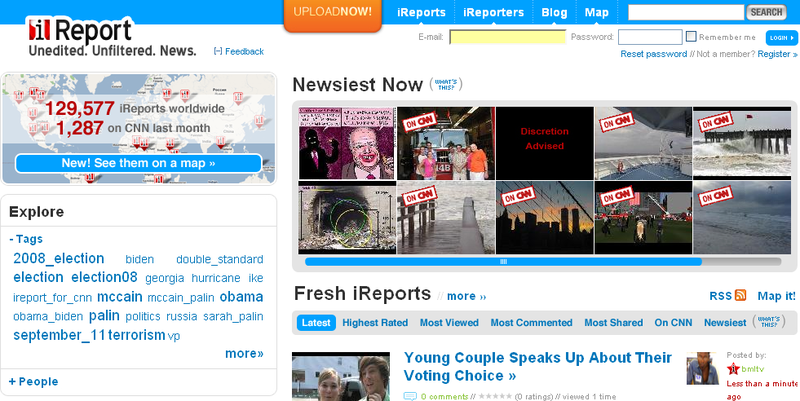 iReport is a meaningful part of CNN coverage across all platforms. We ask people to participate but we have to vet it and verify it, and then integrate it into our coverage, not just a special segment where you stick the iReports. By any measure, iReport has been a success. CNN says it has received more than 175,000 submissions in the two years since it first solicited photo and video contributions from users.